Have you ever felt compelled to “go the extra mile” to help someone in need? That happened to Karen Rasinger, Administrative and Communications Officer HR Pensions and Benefits. In April, Karen along with her husband and a bunch of very good friends signed up for the Enbridge Ride to Conquer Cancer cycling event benefiting the Segal Cancer Centre at the Jewish General Hospital. 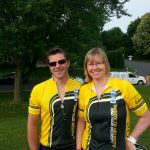 After four months of training, Karen completed the ride and raised $2,890, surpassing her $2,500 goal. Some 1,778 riders took part in this year’s event, raising a total of $6.3 million for the cause. The two-day 233 km ride took place on a hot and sunny weekend in July, cycling from Repentigny to St-Augustin-de-Desmaures (near Québec City) along scenic highway 138. “Day 1 was hot and humid, cycling 113 km from Repentigny to Trois-Rivières through endless corn fields. Day 2 was a little cooler, a longer ride from Trois-Rivières to St-Augustin-de-Desmaures, pedaling 120 km up and down many hills,” recalls Karen. She and her team rode about six hours each day. When Karen started training, riding 10 km was a struggle. Several weekends later, 60 km was considered a piece of cake. Not necessarily keen on competitive training, Karen wanted to take on the challenge. Although her goal was to raise money for the cause, she also realized that being healthy isn’t something to be taken for granted, especially after having lost a loved one due to illness. She still cycles regularly and has found a physical activity she really enjoys. “It was truly an amazing experience I will never forget! It was very emotional, thinking about family and friends who are battling cancer or who have lost loved ones to this horrible disease, something I will never forget,” says Karen. “Riding for this cause has made me realize how important it is to help those who can’t help themselves. I am lucky to be in good health and because of that, someone else can benefit, which is powerful motivation,” says Karen. She has already signed up for next year’s ride.